With just 268 students, Leadership High School’s enrollment size pales in comparison to most. So how did they win their league? The San Francisco Glens of USL League 2 are proud to partner with the Examiner in highlighting a different boys’ or girls’ soccer team, coach, or player in The City every Sunday. With just 268 students, Leadership High School’s enrollment size pales in comparison to most rivals in the CIF San Francisco Section. 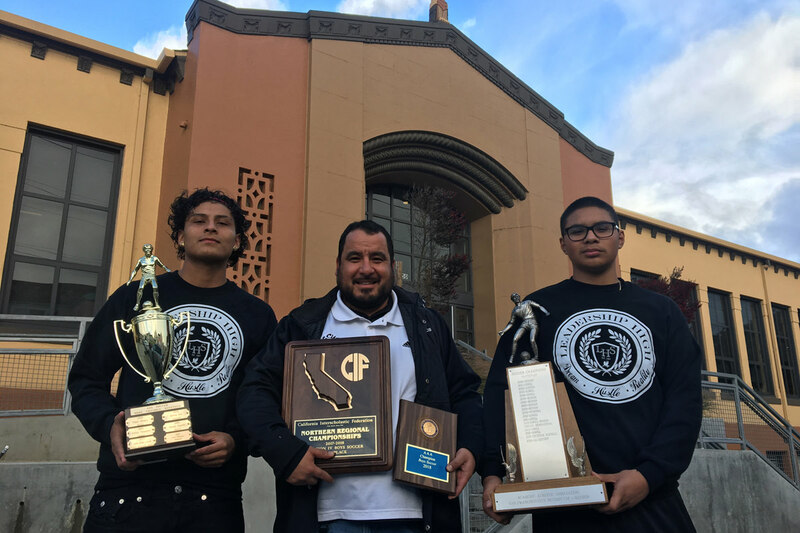 But when the smoke cleared last season, their boys’ soccer team emerged as league champions and advanced all the way to the NorCal Regional Division IV final. “People see us as a small school, but we always have high expectations,” said Francisco Dominguez, the reigning CIF-SF Most Valuable Defender and captain of our Preseason No. 3 squad. Athletic director Antonio Medina takes it a step further, pointing to the outdoor futsal court on campus and the lunchtime league that is quickly becoming the stuff of legend at Leadership. It wasn’t always this way. When Leadership first moved to CIF-SF after a successful run in the Bay Counties League, they took some lumps. But Medina had seen this story before. The Griffins’ AD is known around local soccer circles for having built previously obscure Bay City FC into a youth club powerhouse with multiple futsal national championships to his credit. In charge of this band of brothers is Mike Cisneros, the CIF-SF Division 1 Coach of the Year following a 13-6-1 season. “At first we were playing very direct, but once the players started buying in, we grew into a team that allowed for individual creativity with purpose,” he said. However, the heart of the team was in the center of the back line. Dominguez does it all, including playing out of his natural position. Once a speedy and athletic forward, he was initially forced to play defense due to need. “He has a 3.73 GPA, too. I’d like to see Francisco at S.F. State with Adrian,” Medina said, referring to his son—a midfielder for the Glens’ USL League 2 franchise and Bay City alumnus who just finished his redshirt freshman season in the collegiate ranks. Behind Dominguez, the Griffins are in good hands with goalkeeper Mateo Peña-Sanchez, who recorded three shutouts in the playoffs as a freshman. “I’ve always played up against older age groups at Bay City, so I was up to the challenge,” said Peña-Sanchez, whose captain praised his fearlessness. The Griffins will need more of that maturity this season. After key losses like Anderson Muñoz and Jhovany Castaneda, Leadership will likely field four freshmen in its starting 11. This same piece was featured on SFExaminer.com. Originally founded in 1961 by the Irish-American community, the Glens have been a mainstay of the San Francisco soccer landscape for decades, winning numerous amateur titles in the historic San Francisco Soccer Football League and competing for national titles throughout the '70s, '80s, and '90s. The addition of the San Francisco Glens' USL League Two team in 2018 to the top of the club's pyramid is the latest evidence of the club's growth on their path to the professional ranks. Along with the Glens' youth club, SF Glens Evolution—aU.S. Soccer Development Academy member—the Glens are the largest soccer club in San Francisco, providing all levels of competition to over 70 teams and 1,300 youth and adult soccer players. To learn more about the San Francisco Glens, visit SFGlens.com and follow the club on Facebook, Twitter, Instagram, and Snapchatâ€”all using the handle @SFGlensSC. A part of the United Soccer Leagues, which also operates the Division II USL, the newly-announced USL Division III, and Super Y-League, the USL Premier Development League (PDL) has served as the proven stepping-stone for aspiring professionals. Over 70 percent of all MLS SuperDraft selections since 2010 have PDL experience, including a total of 66 alums chosen in 2018. Among the many players to have played in the PDL before making their professional debuts include Newcastle United FC defender DeAndre Yedlin, 2017 MLS Goalkeeper of the Year Tim Melia, 2017 MLS Defender of the Year Ike Opara, and U.S. Men's National Team members such as Darlington Nagbe, Brad Guzan, Geoff Cameron, and the Bay Area's own Nick Lima.